Krispy Kreme Halloween Free Donut! Get your free Krispy Kreme donut on Halloween the easy way! 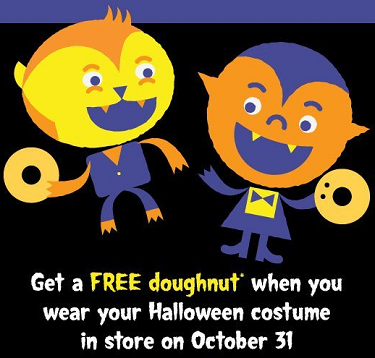 Come on into the store on 10/31 and just wear your costume into the store and pick a yummy free donut! And the fine print on the free Krispy Kreme Donut: No purchase necessary. Offer valid on 10/31/13 at participating US and Canadian Krispy Kreme shops and is subject to product availability (which may vary by market). Limit one free doughnut per guest per visit. Not Valid with any other offer. Not redeemable at grocery or convenience stores. Customer pays any sales tax. Void where prohibited.